Generic Clomid is a female stimulating drug inducing ovulation in patients with rare or no ovulation in natural menstrual cycles. The drug contains Clomiphene – an FDA approved medicine for ovaries stimulalting. The medicine improves fertility in female patients. Only women can take the drug. The medicine provides stimulating effect on a pituitary gland to produce and release more hormones needed for ovaries to mature healthy and viable eggs and to release these cells on time. Generic Clomid must not be used uncontrollably due to a range of contraindications. A woman must know for sure the true cause of the condition of infertility. What should I know about generic Clomid before I order the drug? How to take generic Clomid? Generic Clomid as any brand drug containing Clomiphene is only a prescription drug. We strongly recommend you to see a doctor and to get necessary examinations (ultrasound investigation, blood tests to detect hormone levels in the body in both parts of menstrual cycle). The examination must exclude certain conditions as Fallopian tubes obstruction, new formations, inflammations and adhesion of tubes. In these cases the stimulation can lead to fallopian pregnancy which is a life threatening condition (requires surgical removal of a tube in which a fertilized egg is implanted). The second reason, why seeing a doctor before you buy generic Clomid online is the individual schedule of intake of the drug as well as individual recommendations on dosages. Generic Clomid is an effective drug for treatment such conditions as anovulation, polycystic ovarian syndrome. Clomiphene must be taken with great caution. ultrasound investigation of uterus, ovaries and Fallopian tubes to estimate overall condition and to exclude malformations. The examination of uterus and blood for hormones must be passed twice: in the first and in the second phase of menstrual cycle to estimate the progress and the development of endometrium and the condition of ovaries. The doctor will also estimate the length of menstrual cycle and the duration of menstrual bleeding. That is why generic Clomid is a prescription drug. You can buy the medicine online, however you must not start stimulation without checking and monitoring of your condition by your health care provider as the uncontrolled treatment may lead to the serious consequences. The next reason to visit a doctor before your purchase Clomiphene and start ovulation stimulation is contraindications and precautions in usage of the drug. Most of these conditions will be diagnosed during the pre-stimulation examination. Generic Clomid is a drug that must be taken keeping to a strict schedule which your doctor will determine individually for your case considering the length of menstrual cycle, following conditions and levels of hormones. Normally Clomiphene is taken from the 3rd to the 7th day of the menstrual cycle in a dosage which your doctor prescribes to you. These period of intake is prescribed to patients with a normal length of menstrual cycle which is 28 to 30 days. However if your menstrual cycle commonly lasts longer or shorter, your health care provider will indicate other dates of intake. Clomiphene is taken exactly as it is prescribed by your doctor. Never increase or lower a dosage on your own. Some patients desire to increase chances for impregnation and take larger dosages. In this case hyperstimulation is more possible. Hyperstimulation is a risky and lethal condition. Do not take lower dosages as in this case you will not get a desired effect. Generic Clomid is taken commonly for 5 days. Normally the ovulation happens within 8-10 days after the stimulation. Mind that proper sexual intercourses must take place during your ovulation. Mind that generic Clomid must be taken only in the first part of the menstrual cycle. In the second part of the cycle Clomiphene does not help impregnation in any way. Your doctor may appoint you certain examinations after ovulation as ultrasound investigation to check and monitor the condition of ovaries and endometrium. In case of hyperstimulation your health care provider will prescribe you urgent treatment. 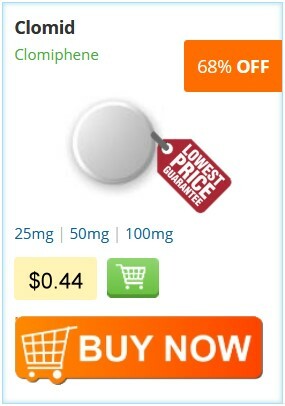 Generic Clomid increases your chances to get multiple pregnancy. The drug must be taken at certain dosages and at certain time. It is very important. Please, consult with your doctor in advance on your actions in case you miss a dosage. Mind that Clomiphene does not stimulate your sexual desire, the drug is taken in the first menstrual phase when low sexual strive is a norm. Generic Clomid is forbidden to use each month. Only three stimulations under a strict supervision of your health care provider are allowed. In other cases you will need to try other ways to get pregnant. During your first stimulation it is strongly recommended to monitor your condition and ovarian response with ultrasound investigation. Please, consult your health care provider whether the drug is right for you before you order generic Clomid.